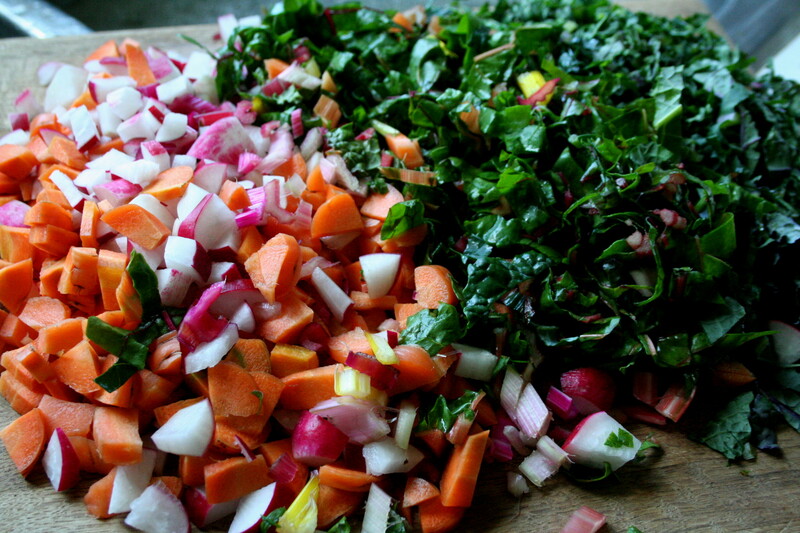 I have been calling this mixture here–french breakfast radishes, spring carrots, rainbow chard and kale (three varieties today–purple and green lacinato, plus red russian), plus the beets before we ate them all–my confetti vegetables. They are the bulk of what we are harvesting, besides lettuces, and so it is this combo cooked with loads of coconut oil, green garlic, and green onions, and served with a little something–poached eggs and pork today–for one of our meals, then a hearty salad, with a little meat, for the other. This, plus eggs, for breakfast, everyday. Simple stuff. It would seem redundant, perhaps, if it weren’t so pretty. Or if I didn’t feel like I was having a little party on my plate each day with all these colors. Or, perhaps, if tender, fresh, spring vegetables weren’t so damn good. We round it all out with peas and strawberries, and even early ripe raspberries, for snacks, al fresco. Recipes come in all shapes and sizes. This spring, each meal I cook has three main ingredients–fresh, simple, and beautiful. It strikes just the right chord of this season. Topped with a dash of love, each day, and we are filled. Looks divinely delicious! I joined s CSA this year and can’t wait for my first pickup (less than a week yet). It will be a good challenge to learn to cook & west seasonally, too.